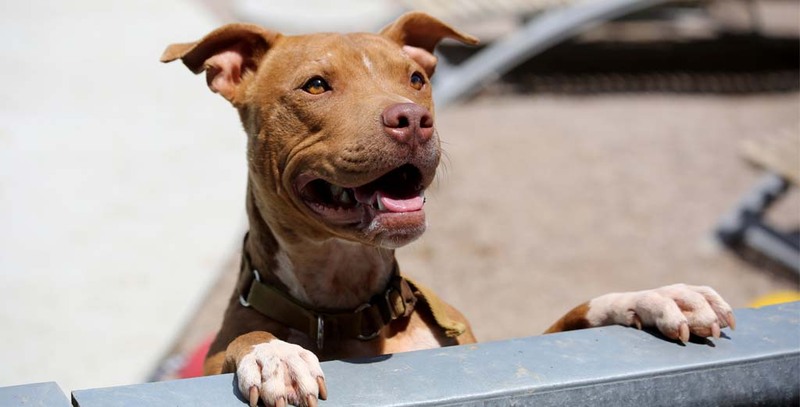 Back in 2013, 63 Pit Bulls were rescued from a small farm in rural Holbrook, Idaho, where the site served as a makeshift dog-fighting ring as well as a marijuana farm. Fortunately, while the dogs were scarred and malnourished, they showed great potential for rehabilitation and adoption and were taken in by both the Idaho Humane Society and BBBR (Boise Bully Breed Rescue), an animal rescue group that specializes in finding homes for at-risk pit bulls and pit bull mixes. Today, BBBR is still striving to rescue and find homes for pit bulls and other bully breed dogs — a noble effort that stems from a number of prevailing myths about pit bulls as dangerous pets — something that simply isn’t true! To get the inside scoop on this wonderful non-profit rescue, we spoke with Jessica Bennett, pit bull lover and one of BBBR’s many volunteers. KM: How and why did BBBR get started? JB: BBBR has been around for about 6 years now. Our founder has always been in animal rescue both here and in California, helping animals get fostered and into homes. After doing that for a number of years, another gal mentioned that they should really make it official, get some funding, make some connections, and get started. KM: You work in close partnership with shelters to find these dogs — how does that process work? JB: Boise Bully Breed Rescue only works through the shelter system — we do not take owner surrenders. We take in dogs who have run out of time, are on the euthanasia list, or are in distress. These are the dogs that are referred to the shelter. KM: Do you ever go and find these dogs, or do shelters contact you directly? JB: It goes both ways. We have volunteers that overlap — that are also volunteers at the Humane Society, West Valley, and others. We have eyes on the situation and good relationships with a number of shelters. Sometimes there is a dog that is kennel stressed and needs to get out of the situation, other times they’re scheduled to be euthanized or have been there too long and that’s when they will get in touch. So yes, sometimes they [the dogs] are spotted, other times they are referred. KM: You’ve mentioned kennel stress as a factor — what is the criteria for choosing dogs? JB: You know the statistics on euthanasia — so we look first at bully breed-type dogs, but we also have sister rescues that have been started by the same founder and core group: Boise Black Dog Rescue and Boxer Rescue of Boise. While many of them are pit bull-type dogs, many of them are mixed. As long as the dogs present well to the public, their probability of adoption is good and odds are they’ll get homes. But we try not to leave any behind unless their healthcare needs are overwhelming or we don’t have a single spot to put them — but I have to be careful when I say that. We’ve taken in dozens of dogs that have needed hundreds, thousands of dollars in medical attention. It’s only when the level of care needed impacts their quality of life, or they don’t respond to treatment, that we’ll take the veterinarians recommendation that they be humanely euthanized. KM: Do you take in dogs from across the nation, or just locally? JB: Our dogs are mostly from Idaho, but there are exceptions. We do have close relationships with Eastern Oregon, especially Ontario, because they have breed bans. We get quite a few calls from Ontario because of that. But we’ve also taken some in from Washington, Utah, and even Wyoming. KM: On average, how many dogs does BBBR take in every month? JB: This month, we’re quite low — somewhere in the mid 20’s. Usually around 40 are accepted from shelters around the valley. KM: How do you go about finding homes for these dogs? JB: We have a network of foster homes; we do not have a brick and mortar location. Volunteers can sign up on our website to be on call as a foster family, but when fosters are unavailable, we can call out via Facebook, which has been really effective lately. We also have a small number of boarding facilities that we partner with at a reduced rate when we’re in situations where we have no fosters available: Emerald St. Kennel, The Dog House, Pet Palace, Sunnyside Vet Clinic, even a boarding site at All Valley. KM: What are the greatest challenges you and your team face? JB: The most obvious challenge is that there are always more dogs than there are homes. I say that, but then there are the obvious reasons behind that, one of them being over-breeding. So often people are impulsive and buy the first dog they see and then think that it would be a good idea to breed them and sell the puppies on Craigslist. What they don’t realize is that the majority of those puppies are going to wind up at the shelter, and it creates a vicious cycle. The other big issue is negligence stemming from ignorance. Not every dog that comes through the door is abused, of course, but many adopters simply don’t take the time to take care of them. Some of these animals will wind up back at the shelter because of it which perpetuates the cycle. KM: What is the application process and qualification criteria for potential adopters? JB: We always use our better judgement first and foremost, but there a few things we look for, including a stable history of good pet care. Ideally having a vet already established, along with a referral; we’ll usually place a phone call or two. A stable living history and a letter from the landlord that states the allowance of not just a pet, but a bully breed; many places, especially big apartment complexes, don’t want to deal with the bully breed issue. Basically, decent references. Preferably a fenced yard, but if they can step up and show that the fence isn’t going to be an issue then we will consider them. KM: Why do you think bully breeds get overlooked? JB: A few reasons, but you definitely can’t overlook social awareness. Good or bad there is always chatter online and elsewhere [about Pit Bulls]. But they are terriers, and not every person or household is matched to a terrier temperament. They’re active and have more get up and go — not everyone is cut out for it. Or it’s a stereotype that that they believe. Those are the big two: either listening to society’s opinions or knowing that they can’t handle a Pit Bull dog. On our website we have a fabulous list of trainers that align with us, and whenever we get a dog that needs a little help or is lacking basic manners, we can partner them with a trainer, which is covered by the rescue. And for adopters who need additional training or for those who are not covered by BBBR, there are tons of options: trainers who specialize in behavioral issues, puppies, Canine Good Citizens, and more. KM: What do people normally look for when selecting a pet? JB: Most of our adopters are already a big fan of the breed or may even already have a pit bull at home. Overall, they’ll contact us with a love for the breed and the community that having a pit bull brings — like minded people with an understanding of Pit Bulls. And that’s really what BBBR is all about. So often our adopters simply want another pit bull to adore because they already know how great they are from experience. KM: We’ve already talked about how training can be important, especially for bully breeds. What should potential adopters know? JB: People should know that there are resources available, and that whether through BBBR or the shelter there are a lot of great trainers out there. Personally, I took a trainer with me to the shelter, which may have been overkill, but it’s easy to get wrapped up in the emotion when choosing a pet. It’s important to pick the dog that’s right for your family and your household, as well as get training involved. Most problems that new adopters encounter aren’t problems, the dog just need some consistency and training. There’s a wealth of information online, but training is an expense that should be factored into the budget when adopting right from the start. KM: What is something absolutely unique to pit bulls? JB: I think the biggest thing is that they are more “bondable.” Every dog owners will say that they have a special bond with their pet, of course — Golden Retrievers, Labs, Chihuahuas — but there is just something about pit bulls. They’re so human-oriented. One fun thing: in the early part of the 20th century, the very first person to drive across the country in a car, Horatio Jackson, picked up a pit bull in Caldwell, Idaho. He took him all the way across the nation with him from California to New York. It was in 1903; he bought the dog for $15 and named him Bud. KM: What would they suggest to a pit owner if they felt they had to surrender it? JB: It’s impossible to know because every circumstance is different, but the first thing I would suggest is to look at their reasons for giving them up. Do they just need training? If you’re in an extreme situation, some trainers may be willing to do a sliding scale or accept delayed payment. If the reasons have to do with a landlord or financial circumstances: do you have anybody who you can ask for help? Someone who can rehome them into a safe environment, not on Craigslist, or someone who might even help by taking the dog. A last resort is of course a shelter, but the statistics aren’t great for dogs coming out of shelters, although they are pretty good in Idaho. That doesn’t mean everyone should dump their dog off at the shelter, of course! That’s not the solution either. Overall there is a lot of impulsiveness and bad choices out there, but I would like it if people could pay closer attention to their choices when they’re taking a dog home. You might think you’re saving a life by snatching up the first dog who looks like they need you, but that can just make things worse. If you adopt a dog and don’t give it the proper attention and treatment, a few years later, they might have a behavior issue that wasn’t there before. So you take it back to the shelter, and they’re going to have an even harder time getting adopted. One thing is for sure: pit bulls are no different than any other dogs, and are just as deserving of loving forever homes as their non-terrier counterparts. If you need more convincing, check out our two-part series on why pit bulls should be your new best friends, or our article on less adoptable pets! An online space where pet owners create their pet’s profile. Why? Because pictures and videos of the pets we love can tell a story that does them justice. A KirinGie.Me pet profile can serve as our memory lane, or be used as a quick, shareable reference if our pet is lost, or a future landlord is on the fence, an opportunity for neighbors to get acquainted, get together and socialize, or if the human / pet relationship doesn’t work out, or life takes the wrong turn where rehoming is the only choice…this profile becomes a treasure trove for the community and an animal shelter to do right by the pets we care about. If this vision is something you can see yourself supporting, subscribe and stay tuned.